Create QR codes with images, sounds, text, videos and documents from your device. 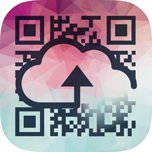 Cloud QR automatically uploads files to the cloud and creates QR codes from the link. Create QR codes from many different sources. Images and Sounds is uploaded to the web for you. QR codes that links to popular video sites like Youtube and Vimeo only shows the video player without social features. Print multiple QR codes at once and fit as many as you like on each paper. Use the built in microphone and records sounds. The file is uploaded to the Internet and a QR code is created for the link. Add colors and textures and give your codes a easy to remember name. The history tab makes it easy to reuse your codes. Give them a name to find them more easy. Do you wonder how to create a QR with an image? Or sound? Or YouTube video? Check these tips out! In my opinion, this app is really well thought-out. There's even a voice synthesis providing audio versions of texts from scanned QR codes. This app deserves top grades! Cloud QR is made with privacy and schools in mind. You only need an email address and a password to get started and you have control of any file you upload to Cloud QR. If you delete it it is gone from our servers. We never ever sell or share your information with third parties.